Is ‘The Salesman’ the Best Foreign-Language Film of 2016? Is The Salesman the best foreign-language film of 2016? Times change. This year, the film that represents Iran in the Oscars competition, as determined by government officials, is Asghar Farhadi’s The Salesman, which not only mocks the censors but quietly makes a visit from them into the turning point of its plot. The mockery comes early in the proceedings, when some of the characters are rehearsing a production of Death of a Salesman starring the film’s protagonists, Emad and Rana, a married couple who lack ready cash but still have good looks, midlife vigor, and lots of cultural capital. Their troupe is working on the scene in which Willy Loman’s girlfriend exposes his adultery by bursting half-naked out of a hotel bathroom—but, this being Tehran, the actress has to be fully dressed and then (just for safety’s sake) buttoned and belted into a raincoat, which, to her great annoyance, prevents the play’s Biff from keeping a straight face. The visit from the censors—mentioned but unseen—ensues after the play’s opening night, when Emad learns he’ll need to stay late so he can discuss with the authorities whether another three scenes must be cut. Rana goes home to clean up and wait for him; and though no one ever again talks about the late-night conference or blames anything on the delay it’s caused, the consequences play out for the rest of the movie. While Emad is busy talking with the morals squad and Rana is alone, someone breaks into their ramshackle rooftop apartment. Although The Salesman isn’t always the subtlest film—when Emad and Rana rent the apartment and he says, “For once it looks like we’re in luck,” you know they’re screwed—the movie has a balance of reticence and outspokenness, of nuanced observation and easily deciphered symbolism, that is highly effective and by now familiar in Farhadi’s work. Unlike the giants of the preceding, heavily censored generation of Iranian cinema—Makhmalbaf, Abbas Kiarostami, Jafar Panahi—Farhadi shuns nonprofessional performers in favor of experienced actors, preferably of the famous and beautiful kind, and shows no interest in formal games or narrative conundrums. He aspires instead to write well-made social-problem scripts—something like Death of a Salesman, for example—and is happy to invite the audience to discover parallels (no compass or map needed) between the situations in his movie and those in Arthur Miller’s play. 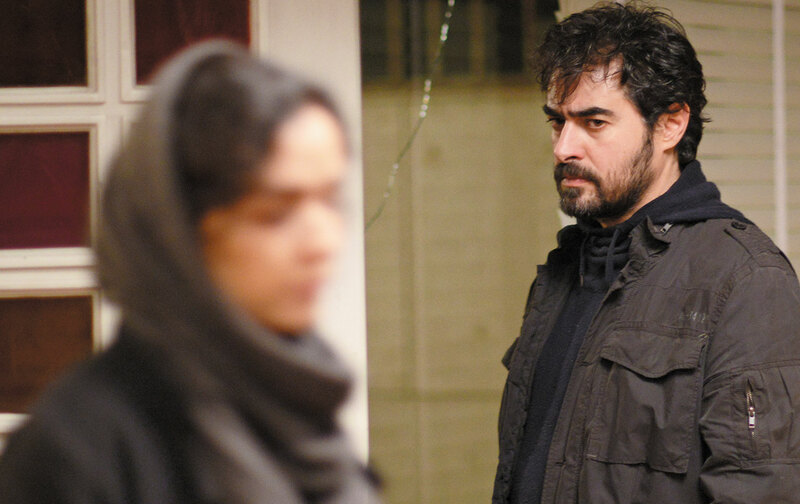 It’s a conventional, accessible approach to filmmaking—­you might almost call it a return to an Iranian “tradition of quality”—which in The Salesman tugs you into some of the same themes that Farhadi made so engrossing in his 2012 Oscar-winner, A Separation. You see and feel the fragility of marriage, the importance and impotence of book learning, the animosity that festers, barely concealed, between the classes, and the claustrophobia that results from being ruled by cops and theocrats. Did the censors let that go only because they’ve learned, as the Soviets did before them, that it’s useful to release a social critique onto the international festival circuit, so long as you don’t show it at home? The answer, apparently, is no. The Salesman opened in Tehran last August and quickly became the box-office hit of the year, winning even the tribute of being pirated. From these facts, I can draw no conclusions beyond the obvious. For whatever reason, a faction in the Iranian government is willing to let Farhadi speak and is strong enough to clear his way toward the podium. It will even let him complain in public that he isn’t allowed to speak enough. As for the ticket-buyers—who, I presume, are urban, educated, and nonpious, like Emad and Rana—they must long to see their dilemmas and fears being shared by the people on-screen, and are grateful that these characters live in a movie that tests neither your wits nor your patience. But this is not to say that The Salesman flatters the people who have flocked to see it, or that it’s left them with nothing to puzzle over. The movie’s main literary model is Death of a Salesman, but Farhadi also builds in a second point of reference: Gholam-Hossein Saedi’s novel and play The Cow, which Emad teaches in the high school where he makes a basic living. Emad even shows his boys Dariush Mehrjui’s film version. A whiff of the 1960s, and of an earlier era of government crackdowns, blows into The Salesman with this memory of the beginnings of the Iranian New Wave. It hints at mysteries, existential and narrative, that don’t quite fit into the Arthur Miller framework. (“But how can a man turn into a cow?” one of the students asks. “Gradually,” Emad replies.) It opens the possibility that you might never learn the most important secrets of The Salesman, however well-made the script. There is never any doubt that while Emad was busy at the theater, someone attacked Rana in the shower—but Farhadi leaves crucial details of the attack hidden from you, from Emad, and perhaps even from the dazed Rana. He tantalizes you further with the character of the woman who previously lived in the apartment, whose loose morals—so the neighbors say—led to the break-in. Like the censors who visit the theater, this woman is unseen and unheard, and she sets the plot in motion. Only traces of her appear in the film: shoes left behind in a closet, a child’s drawings on the bedroom wall. Until very near the end, you don’t even know her name. She becomes decisive in the movie precisely by being absent. Farhadi may be a conventional storyteller at heart with a tendency to make Western Union deliveries—as in The Salesman’s message about an apartment building that’s been shaken to its foundations, leaving its walls crazed. But by imagining a character who is silent, off-camera, and crucial, he links himself, despite everything, to the sly Kiarostami. And when it comes to criticizing people of his own station in life—well-educated Iranians with liberal attitudes, who may not have any money but carry themselves as if they do—Farhadi has a pathologist’s burrowing determination that seems frightful compared with Kiarostami. However much Kiarostami laid bare the frailties of his middle-class characters and made them flail in comparison to the simple folk, he always looked on with sorrow, pity, and amusement. With Farhadi, the gaze is coldly diagnostic. His working-class characters—­poor, devout, and ignorant— suffer without dignity, but at least he doesn’t anatomize them. When Farhadi creates an Emad, it’s for the purpose of giving him the complete work-up. Played by the rumpled but dashing Shahab Hosseini, whose slow-burn performance won him the Best Actor award at Cannes, Emad starts out as tender and supportive toward Rana (Taraneh Alidoosti) and gruffly jovial with the high-school boys who adore him. He’s the kind of man who will carry an ailing neighbor downstairs on his back, and who doesn’t become defensive when a woman falsely accuses him of crowding her in a taxi; he sympathizes instead. Farhadi’s audience must want to see Emad when they look in the mirror—until they don’t anymore. As both his marriage and his play begin falling apart in the aftermath of the attack, you can see Emad’s brow lower over his eyes like a shelf of rock, his lips draw tight, his shoulders bunch in perpetual readiness to throw the first punch. He’s out to find the man who attacked Rana and exact revenge; and if the man isn’t immediately present, then Emad’s students will do as a target, or Rana herself. Emad continues to see himself as a man who’s just trying to do his best. But now, the more furiously he tries, the less certain it becomes whether the best in him is good at all. Is The Salesman the best foreign-language film of 2016? Don’t make me laugh—not at the film, I mean, but at the question, which is as inescapable during Oscars season as President’s Day car-sale commercials and the flu. The world is full of foreign languages, and in 2016 a whole lot of the films made in them turned out to be good. The Salesman is certainly among the better ones. If you’re interested in how well Death of a Salesman might play in Tehran, and what damage censoriousness can do to people (even those who are permitted to speak a little), and at what point precisely a good man’s virtue turns to hypocrisy and his marriage to rubble, I might even say The Salesman is indispensable. We know this much about the Oscars committee that winnows all of the official foreign-language competitors to a short list of nominees: Its members consider a plot involving World War II to be a sure sign of artistic merit, especially if one man can find redemption in the picturesque slaughter. So here, contending for an award against The Salesman and Toni Erdmann (a movie that wouldn’t know the difference between redemption and a soggy green petit four), is Land of Mine, Martin Zandvliet’s contribution to the genre of the steadily shrinking platoon. The novelty of this Danish production is that the war’s already over, the platoon’s members are all captive German soldiers—very young ones at that—and the attrition isn’t due to enemy fire. The soldiers are simply exploded, one by one, on an extended work detail. This much of the story is true: During its occupation of Denmark, the German Army buried more than 1 million mines along the country’s west coast. Following liberation, the Danes of course wanted those beaches cleared and thought it appropriate to assign the task to German prisoners of war. The Danish soldiers in charge of these mine-clearing squads did not feel kindly toward their laborers—nor was the work forgiving by nature. Out of this harsh reality, Zandvliet has fashioned the uplifting fable of Sergeant Rasmussen (Roland Møller), a mustached, eagle-beaked he-man who, at the start of the film, gets his exercise by beating the crap out of random German POWs. By the end, he has developed a warm, protective manner toward the four mine-diggers who have survived in his care. We get to know a little about most of the German lads who lie on the beach under Rasmussen’s carefully distant gaze, unscrewing the tops of mines with trembling fingers, cautiously removing the detonators. And once we get to know them, most of the lads go boom. It’s not hard to make a suspenseful film when the characters are likely to blow up at any moment. Just watch Clouzot’s The Wages of Fear. But Clouzot was a first-rate director who kept his head clear and his filmmaking inventive. Zandvliet is a guy who means well. In Land of Mine, you will get the adrenaline you paid for, and with it a nice, satisfying moral resolution—cheap.